GRILL DIRECTIONS: Heat grill. Using toothpick if necessary to help guide sprigs through prawns, thread prawns onto rosemary sprigs (remove leaves from stem if necessary). In small bowl, combine marmalade, coconut and red pepper flakes; mix well. When ready to grill, spray 1 side of prawns lightly with nonstick cooking spray. Place prawns, sprayed side down, on gas grill over medium heat or on charcoal grill 4 to 6 inches from medium coals. Cook 3 to 6 minutes or until prawns turn pink, turning once and brushing lightly with marmalade mixture. Discard any remaining marmalade mixture. To broil prawns, spray 1 side of prawns lightly with nonstick cooking spray; place, sprayed side down, on broiler pan. Broil 4 to 6 inches from heat using times above as a guide, turning once and brushing lightly with marmalade mixture. Prawns are shellfish. The name is used to describe small lobster-like shellfish, freshwater shrimp-like shellfish and very large shrimp. Use very large shrimp fir this recipe. Prawns are ideal for grilling because they are large enough to skewer easily, yet they cook very quickly. If rosemary sprigs are not stiff, insert a wooden skewer along with the sprig when threading the prawns. 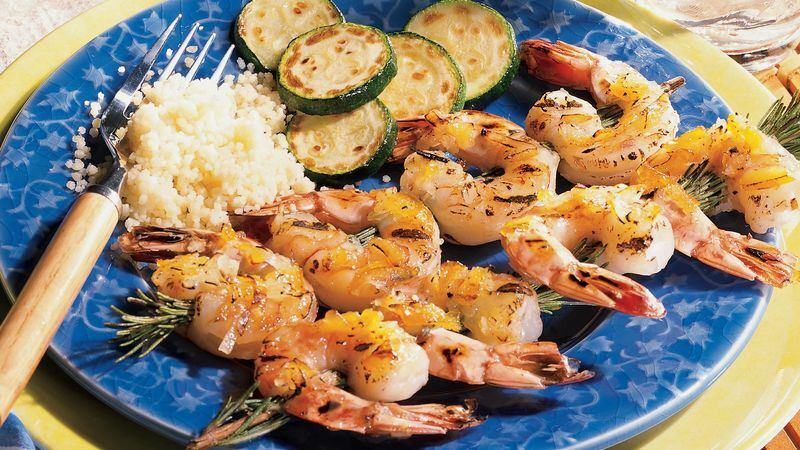 Prawns may be threaded on wooden skewers instead of rosemary sprigs. When using wooden skewers, add 1 teaspoon of chopped fresh rosemary leaves to the marmalade mixture. Add, soak the wooden skewers in water at least 15 minutes before threading the prawns.